I got an email or saw something online about this challenge. It really struck home for me and I’ve signed up to do it. 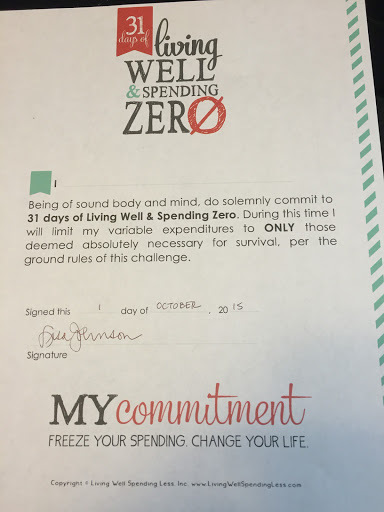 Basically, you have to go for 31 days without spending any extra money on things that aren’t essential. Essentials are going to vary from person to person, but some suggested ones are giving to your church, paying regular bills and utilities, a much needed car repair, etc. You are also going to be doing a lot of eating from what you have on hand. I don’t have a problem with that because my pantry and freezer are pretty well stocked right now (we’ll see how that worked out at the end of the 31 days), but I will have to purchase some fresh veggies and fruit as I use them for juicing for health reasons. That’s one I just can’t give up. What this is going to mean for me is that I’m going to probably be doing some baking (finally using that block of yeast I have) and pulling out the crock pot for some meals that will stretch out over a few meals. So if you decide to join in let me know how it’s going for you! Previous Post Okay, changed my mind – Update on "63 Easy-To-Crochet Pattern Stitches"